After initial amazement, this innovative design is consistently met with the greatest admiration. Discreetly installed between two domino hobs, its understated glass panel retracts so that vapour and steam from dishes literally vanish with incomparable efficiency. This hood evokes emotions that are rarely seen in relation to extraction units. Following initial amazement, its innovative design is met with the greatest admiration. Its uniqueness lies in the way it sits directly next to the hob, showing nothing but a plain fl at surface in a subtle, deep black glass. This lighting method stands out as consuming almost 85% less electricity and lasting 20 times as long as an incandescent bulb. The system both efficiently illuminates all the pans on your hob and provides you with soft mood lighting that is ideal for over dinner. This system has been designed to totally eradicate any residual postcooking vapours. The hood continues to function for ten minutes after the last speed is selected, then turns itself off automatically. 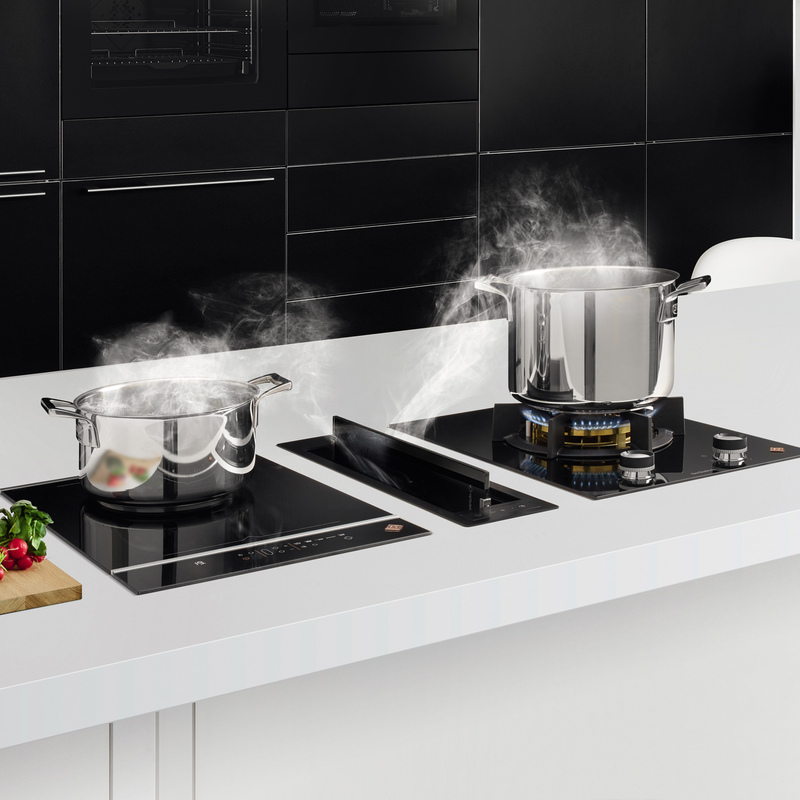 When selected, this feature immediately sets the hood to work at maximum extraction speed for even greater efficiency when large amounts of vapour or cooking aromas are present.